Google’s Chelsea office space in New York takes up an entire city block on 8th Avenue between 15th and 16th Streets. The building itself offers nearly 2.9 million square feet of usable office space, with Google taking up roughly a quarter of that. Located in NYC’s premiere contemporary art district on the west side of Manhattan, Chelsea has become one of NYC’s most sought after residential locales. Purchased in 2011, just after the infamous bubble burst, Google got quite the steal; paying just $690 per sq ft – less than half of what it was being offered at just a few years earlier. Purchasing the building for $1.9 billion – in cash – they immediately set about putting their unique stamp on it from top to bottom. What resulted is one of the most stunning and individualistic offices in all of New York. 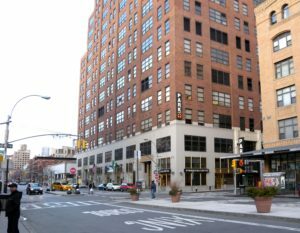 Here is a look at 6 things that make Google’s Chelsea office space one of the top real estate destinations in New York. When Google takes over an office space, they don’t just remodel, they completely re-imagine. Every one of Google’s 24 North American offices has a unique look and feel that matches the city in which it resides. Google doesn’t want California employees to move to New York and feel like they are still working in the same office. The New York office features a hallway paved in subway tiles, complete with a fire hose fixture and walls painted in throwback graffiti. There are a number of themed conference rooms, including a subway-themed room, complete with a wall-sized map of the NYC subway system and a Broadway-themed room, complete with elegant gold chairs upholstered in plush red velvet. Google’s unique sense of humor is displayed throughout the space as well. One meeting room is completely designed to look like a small, vintage New York City apartment, complete with Mr. T china prominently displayed on the walls and even awkward family photos. A Victorian library features era-appropriate framed photos of Star Wars characters. Each area of the Chelsea space is an homage to various eras or areas of New York City. One wing which is designed in tribute to New York City’s famed Meat Packing District. In this wing, design staples include light fixtures made of actual meat hooks and retractable storefront gates. Infamous for using Segway’s in their Silicon Valley offices, Google’s Chelsea office offers scooters to transport employees through their half million square feet of space. Moving between floors is regularly a challenge in New York’s older buildings, where elevators are slow and notoriously unreliable. To this problem, Google took a typically unique approach and installed ladders between floors, complete with messenger bags to place your laptop or other items in, leaving hands free to ascend or descend the ladder. In one two-story lounge area, an oversized steel slide allows for a quick, convenient – and fun – descent from the second floor. A satellite office located across the street above Chelsea market is accessible via an overhead walkway, decorated in traditional Google-esque fashion. Google understands that in order to attract top talent, they need to offer a number of perks to beat out their competitors. One of those perks is the free food that is offered in a number of their offices. “Free food“ ranges from a wide variety of snacks on-demand to gourmet meals prepared by celebrity guest chefs – of which there is no dearth in NYC. 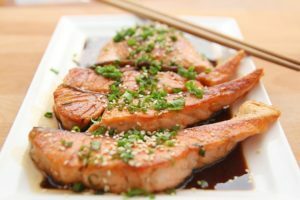 Meals are prepared and served in one of 5 different themed cafes, including the enormous 5 Borough bistro, while snacks and other smaller meals are served in numerous micro-kitchens throughout the space. Offerings include simple snacks like candy and trail mix but also include healthy options from local farms and spectacular confections from local bakeries. The micro-kitchens include a green themed micro-kitchen, (an homage to Google’s commitment to sustainability) and one cafe is located in – you guessed it – a converted water tower. With 3,000 employees working under one roof, it’s feasible for some groups of employees to never have cause to interact with other groups. The Chelsea office space is actually carefully designed and orchestrated to create as many opportunities for interaction between diverse employees as possible. In essence, the office space is designed to work much like New York City itself, by creating opportunities for diverse groups of people to have random encounters as much as possible. One way they do this is by moving their employees frequently. Google employees joke about how if you don’t like where your desk is, don’t worry, it will change tomorrow – and there is some truth to this. However, with fully customizable desks and workspaces, this is not as much of a hardship as you might imagine. With all the hustle and bustle of a busy office, Google understands the need for privacy and quiet. The Chelsea office is loaded with nook, crannies and quiet corners where employees can think, meditate or just do some work in peace and quiet. In the library, bookshelves revolve to reveal hidden meditation rooms and private phone rooms are scattered throughout the space. Google employees frequently work long hours, which can be hard on furry companions. Google has long been a dog-friendly company and its New York offices are no exception. Google’s dog policy provides employees with a basic set of guidelines regarding cleaning and being mindful of allergic co-workers. Cat lovers are out of luck; however, since the presence of so many dogs doesn’t create a feline-friendly environment. Google is an innovator and trendsetter in so many areas, it shouldn’t be surprising that they are an innovator and trendsetter when it comes to office design. Every inch of space in Google’s 2nd largest office seems to have been carefully and artfully considered. Not only is the design and decor carefully and thoughtful designed, but even the specific way space is used is designed with a very specific outcome in mind. Google has long been known as a company that works hard to incorporate the needs and desires of their employees into their office design and New York is just one more city in which they have stayed true to form. Are you looking for office space like Google’s? Let us know what you’re looking for and we’ll help you find it. We make it easy! 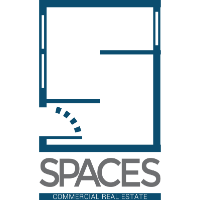 Spaces Commercial Real Estate helps businesses in NYC find and secure great space. Whether you’re one person running the show or have a cast of characters to do your bidding we’ll help you find the right space and at the right price! Click below for more information. Jack Cohen has over 15 years of industry experience developing and implementing real estate strategies for clients in Manhattan and throughout the United States. Prior to founding Spaces Commercial Real Estate, Jack was a Managing Director at Colliers International for 3 years and a Director at Cushman & Wakefield for 9 years. Jack’s forward thinking has engineered some of Manhattan’s most unique and difficult deals including the repositioning and leasing of 636 11th Avenue, a 564,000 RSF warehouse to office conversion, which was awarded real estates highest honor- REBNY’s Henry Hart Rice Most Ingenious Deal of the Year Award. Jack is a graduate of Rutgers University School of Business where he majored in Economics and Business Management. He is a member of the Real Estate Board of New York, the executive committee of American Israel Public Affairs Committee (AIPAC), and the Board of Education of Keter Torah, his childrens’ school. Jack lives on the Jersey Shore with his wife and three children.